Scrummy goat's cheese. I quote my mother-in-law, "This is penicillin from heaven." Wandering round the wine cellars of Vouvray and seeing how they make methode traditionelle (did you know they turn the wine bottles with the corks pointing down so that the sediment collects on the bottom of the cork, and then they freeze the sediment and pop it and the cork out the top before re-sealing the wine?) That made me really appreciate sampling their delicious bubbly afterwards! 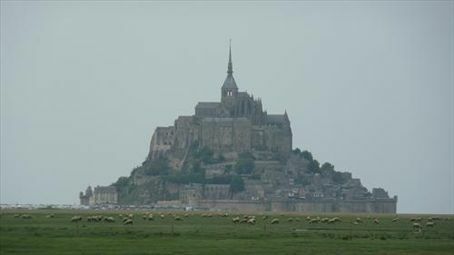 After three castle filled days, we headed north to Normandie, via Mont St Michel, the monastery surrounded by sea or sand, depending on the tide. It was a truly beautiful sight viewed from afar, with grazing sheep in the foreground. Up close though, it was a bit of a tourist nightmare. We happened to pass by on the French version of Labour Day, so the whole country had turned up to pay a visit. Needless to say, any quaint charm in the streets was absorbed by the thousands of other sightseers long before we arrived! Bayeux is home to the famous tapestry (which is actually embroidery, but anyway). I was actually thinking of staying in the car and resting while James and Kate went to see the tapestry. I mean, how exciting can an old piece of cloth be, right? Yet, at the risk of sounding like a nanna into handcrafts, I was astonished at how interesting the tapestry was. It's basically an enormous strip of linen (70 metres long) that tells the story of William the Conqueror's victory at the Battle of Hastings in 1066. And they embroidered the story onto the linen with wool in about 1067. Which makes it a VERY old piece of cloth! And the amazing thing is, after almost a thousand years, the colours of the wool haven't really faded. And they managed to tell a complicated story: horses, boats, battle, kings, treachery, feasts and all, with only four colours. They display the tapestry inside a huge glass case, and they give you a wee headset to listen to as you walk round. Almost every metre shows another scene, and the audioguide points out what you might have missed, and fills in other parts of the story. So if you're ever in Bayeux, it is highly recommended!